Systems for Abstraction features the work of three artists who use abstraction to organize and present their understanding of the world. Abstract art, particularly painting, is associated with the most radical artistic expressions of the twentieth century, from Wassily Kandinsky's proclamation of the independence of color and Jackson Pollock's "action" canvases to the strict formalism of artists like Ellsworth Kelly and Robert Ryman. In contrast, Jill Olm, Beth Racette, and Leslie Vansen pursue abstraction as a way of expressing systems, processes, and experiences. While deeply interested in the formal elements of color, surface, and space, these artists are also engaged in synthesizing and communicating information, from living systems theory (Racette) to mathematical growth and multiplicity (Jill Olm) and the interactions of work, time, and movement through space (Vansen). The origins of their abstract images are suggested rather than detailed: there are no pie charts or bell curves here. These works are infused with subtle emotions and a rich physicality. They describe the ineffable, unquantifiable aspects of their source material, expressing relationships, data, and bodily experience as abstractions in paint and ink. Beth Racette is compelled by living systems theory, which conceptualizes Earth, or Gaia, as a self-regulating, complex living system with the capacity to maintain the conditions for life. 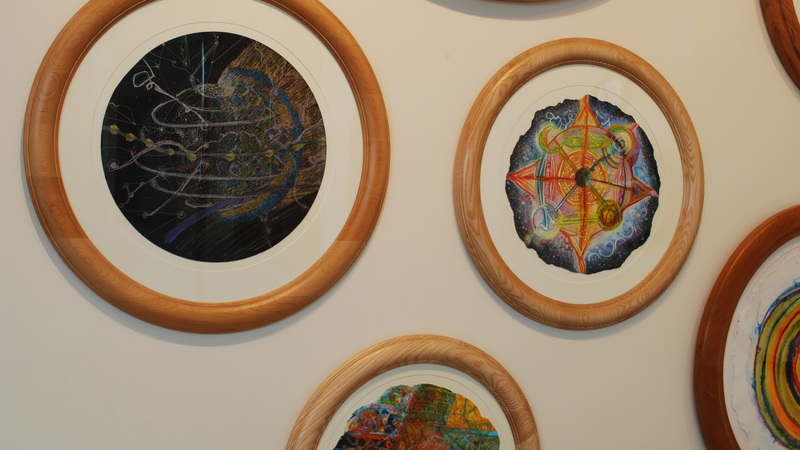 "My aim in creating these paintings," Racette says, "is to learn about and portray the many systems and aspects of the Earth. I have tried to cast a wide net, explore as much as I can, and synthesize my findings visually. These paintings represent an intuitive and impressionistic integration of my exploration." Jill Olm is interested in the activity of mark-making as it pertains to social, geographical, and anthropological systems. Her paintings and drawings are made up of complex, repetitive patterns that indicate exponential growth, abundance, and multiplicity and the influence of industry, technology, materialism, and consumerism. Olm prefers to leave the interpretation of her work open-ended, however, and enjoys its potential to suggest fluid and diverse meanings. For Leslie Vansen, the swirling lines and strong colors in her paintings are analogous to the residue of human action on its immediate environment. Vansen's logic and her process are inherent in each piece; the scale of her work corresponds directly to her own physical presence, and their surfaces map the actions of her body. Yet no specific reference to a place or a moment is intended. Instead, Vansen strives to transmute sensation and memory into "visual force fields and remembered repetitive interactions." Above, left to right: Beth Racette, from the Gaia Series, 2013; Jill Olm, Familiar Embrace, 2012; Leslie Vansen, Tirl, 2011. Jill Olm, Assistant Professor of Painting and Drawing at the University of Wisconsin-Eau Claire, received her MFA degree in painting from Syracuse University. Jill explores mark-making and repetition in her paintings, drawings, and site-specific works. Beth Racette is an artist who works in many media: acrylic ink paintings, sculpture and installation. While her installation work often integrates political and social concerns, Racette's paintings are meditative and improvisational explorations of mind and metaphysical concepts. Leslie Vansen teaches painting and drawing courses from the introductory through graduate levels in the Department of Art and Design at the University of Wisconsin-Milwaukee.